The Bassadone Automotive Group (BAG) are our charity’s main sponsors and make yearly donations and provide all year round support to our charity. 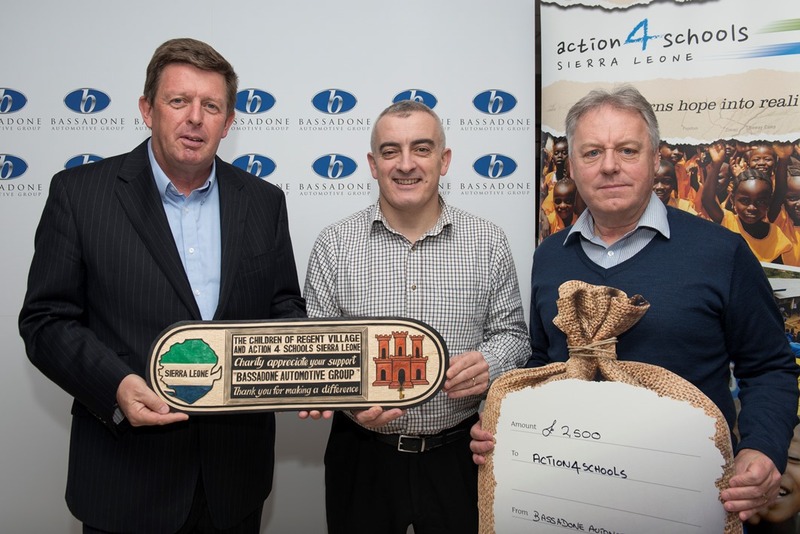 We presented a hand made wooden plaque that was crafted in Regent Village, Sierra Leone as a symbol of our gratitude for their on going support. Thank you BAG ! The Bassadone Automotive Group (BAG) are our charity’s main sponsors and make yearly donations and provide all year round support to our charity. We presented a hand made wooden plaque that was crafted in Regent Village, Sierra Leone as a symbol of our gratitude for their on going support. Thank you BAG ! Golf Experience has been supporting our charity since the very beginning, sponsoring weekend away prizes for our many raffles, making financial contributions and finding new supporters. Thank you Golf Experience !!! There are many ways that companies can support our work in Sierra Leone and have a very significant impact. One-off donations are very welcome, if you would like to make a one-off donation please contact us on info@action4schools.gi or telephone 57631000 to organise a cheque presentation and discuss further. We are looking for long term partnerships which will bring regular support to the charity and also bring regular benefits to companies. You can partner us on a regular basis by providing raffle prizes for our many fundraising activities or by paying in regular amounts to the charity in the same way as personal sponsors do through monthly standing orders. Become one of our “Gold Partners” by pledging a minimum of £20 a week. This will mean that we will include your logo and website details on our website home page and we will include your company when thanking sponsors in the local press such as the Gibraltar Chronicle, Panorama, Insight Magazine, Gibraltar Magazine, GBC Radio/Television and online publications. As a Gold Partner you will be able to advertise the special partnership on the company website and can include our logo and website details on the company website thus linking both organizations and increasing the company “Corporate Social Responsibility” profile. If you wish, we will include your logo on any posters we create and will also include it on our letters and mailshots. Companies can also support our work by encouraging personal sponsorship at company level. We encourage companies to offer staff the possibility of an automated monthly pay roll deduction. Companies may for example consider doubling any fundraising done by the staff through either one-off events or through their monthly pay roll contributions. This programme builds strong bonds between the staff, the company and our charity. Cheque presentations could be organised on a regular basis for local publicity and marketing benefits which will raise the companies’ Corporate Social Responsibility locally. We encourage staff to organise events to raise funds and we can assist with events such sponsored walks, bingo nights, quiz nights, etcetera. Lets discuss ideas through, no idea is too crazy !! If you have any others ideas for support we are all ears!! Lets discuss it please? 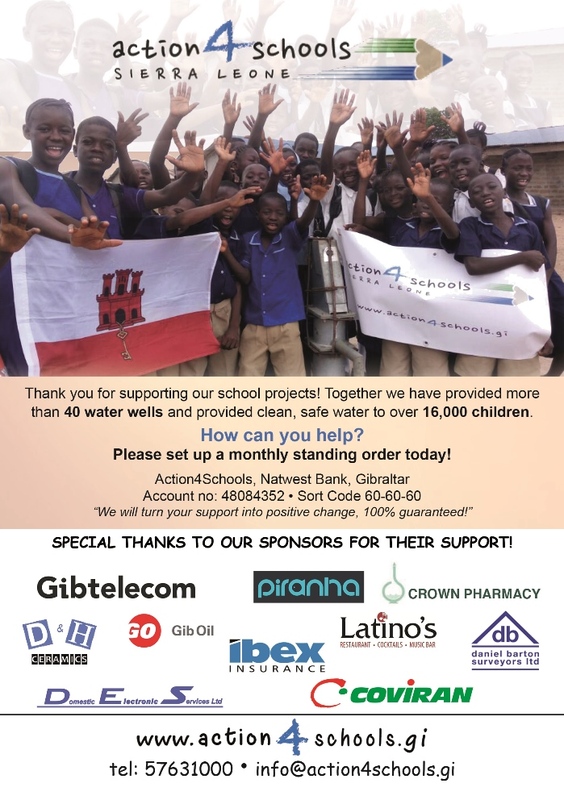 Please contact us on info@action4schools.gi or telephone 57631000 to discuss ways of working together to improve the lives of needy children in Sierra Leone. We encourage everyone to support financially, funding is what turns the hope of a better future into reality. No funding = no action = no progress. Want to do some “action4schools”? Don’t delay, do it now….. Please help us provide solid buildings, safe water, sanitation and very importantly, teacher training for the staff to improve the level of education. Thank you for caring and especially thank you for “doing”.